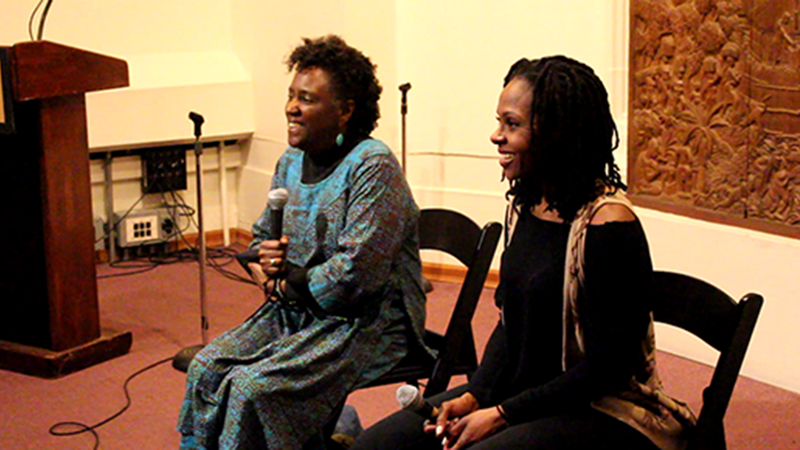 Conversation between director Debra J. Robinson and comedian Kellye Howard after a screening of Robinson’s 1984 film I Be Done Been Was Is, about Black female comedians. Held at the DuSable Museum of African American History, March 7, 2017. Debra Robinson (DR): I am Debra Robinson, and it’s been a long time since I’ve seen this. And thank you for hanging around for the Q&A. So ask away. Kellye Howard (KH): I’m Kellye Howard. I’m a comedian from here in Chicago. I’m really, really excited to be having this Q&A with her. The first time I saw this movie was when they sent me the link last week. And I was just in awe by the changes in comedy since then to now. It has changed dramatically, especially for women of color. So, my first question for her—if you guys don’t have anything initially—is what made you do a film about women in comedy? And I was, like, “Oh, okay, okay.” But I kept thinking, I just don’t remember anyone being a comedian who was a black woman around that time. And I couldn’t think of anybody since Moms Mabley. And I would go to the comedy clubs with her, and one reason I went was I would pull a number—because you had to pull numbers to perform—and so, she wanted to get on as soon as possible. So I’d pull a number too, and I’d say I was a singer, and then if I got a number that came on before hers, I’d give it to her. And so, when I decided I’m going to make a film, that came back to me. That’s all that happened—it came back to me, and I thought, “Well, let me just explore this a little bit more.” And that’s how I happened to do it. And then it seemed like there were black women performing everywhere, but it’s like there was a little ceiling here, that they were just going to be on a local level, in clubs and even, just like Rhonda [Hansome, who appears in the film] said, not even all the time then. They’re working for free, and not even all the time then. And so, when we started looking for women, there were plenty of women. It also occurred to me about my career at the time, because there weren’t any models, really, for me, as far as black women filmmakers. And so, it kind of paralleled at the time. I was just as interested in what was happening to them as I was what was going to happen to me. KH: That definitely answered my question. It was good, it was good. It was thorough. Audience Member #1: I have a question. What influenced you to name it that? DR: It’s the tagline from Jane Galvin Lewis. Yeah, her joke—I mean, she says “I be done been was is,” and I still feel like that about black women in general. Audience Member #1: Yes, I was going to agree with you. DR: Yeah, you know, there isn’t a thing that we probably haven’t done—run businesses, run the home, run the kids… You know, this, that and the other. We do it all without necessarily having had a movement behind us. Audience Member #2: Have you followed the four women? Have you stayed in contact? Are they all working still today? DR: No, I really have not. Alice, unfortunately—it kind of made me sad, seeing her, because she died last year. But I know the other—every blue moon, I might, like I’d hear from Jane and she is like, “Can I get a tape?” or somebody would ask about it or some people would, you know, may want to use her in something else. I’d get those kinds of calls, from time to time. But I moved around a lot, so we just lost touch. KH: Well, Marsha Warfield, she’s still—I mean, she’s not an active stand-up comedian, but she’s had her roles in stuff… TV shows, movies, and things like that. And the other young lady, I believe is Rhonda Hansome. She’s still active. I looked her up after watching the film; I was curious. And she has an active website, as of 2017. So you can read her bio, you can book her. Yeah, she’s still working as a comedian. Audience Member #3: I had a question for you, though. Number one, how did you start? How did you start? Because that’s the hardest thing. Audience Member #4: How has it changed from when this was filmed to now? KH: Oh man, it’s changed a lot. For one, we’re not pulling tickets to get on stage. When you said that, I was like, “What! ?” No, it’s not like that. Really, honestly, in Chicago specifically, because there is a shortage of black women, I tend to work a lot more than probably it would be if I was in New York, where there is a lot of black female comedians. So, being here, I’m the token black chick on most shows. Like, I’m currently on the stage at Second City on Saturday nights, and I’m the only black person on the roster. Well, not on their main stage, but one of their other stages. Or even, like, a mate. Like, Marsha’s talking about how it’s hard to be a mate. It’s a lot easier for black women to date in the comedy scene than it was back then. And we still are considered a threat to male comedians. We get that sometimes, but it’s not as competitive as it was back then. I think there’s more competition between women against women than there is women against men. And then it became so much profanity. And if you went back, they really thought they were doing Pryor. But if you went back and listened to Pryor—because I’ve got all his albums—it’s not nearly what you think it is. It was really his character development and ability to tell great stories that had comedy, okay? So I don’t think it was so much a fear of saying anything; it was just the skill you had to have, okay? It was more, people were looking at more skill. The comedy circuit, as far as… It’s so sad for me to hear that there’s only three or four of you working in Chicago, because there’s so many more then, working in New York. Okay? Because I went to see some people I didn’t use. DR: Because I only wanted—I got it in my head I had to have four people, for some reason. And there were more people working then. Well, a lot of them were like Rhonda, when she said that she was an actress, but she just wasn’t getting a lot of work and she needed to keep working and comedy was one way. That goes on today. I have a nephew that’s an actor—now he’s in L.A., but first he was in New York—and he would do the same thing, and I think he still does that sometimes. He’ll work the comedy, you know, to keep the acting going. So that’s a little different. Whereas you had someone like Marsha, who’s just a pure comedian, okay? Just a purist, in that setting. KH: And I think that is the case. A lot of comedians are actors, and they find themselves doing stand-up because it isn’t enough work for us in TV. There’s not enough roles; there’s not enough opportunities, even for auditions, and agents aren’t really even looking for you. So the way to get seen by an agent is to go the improv route, through Second City, or to do stand-up. And then, you kind of get seen a little bit better, in different aspects of what you can do. Because you can do characters on stage and still be looked at as an actor, like Richard Pryor did. But I feel like, there’s—when I say working, there is a lot of black comedians in Chicago. There’s not a lot of working female comedians in Chicago. So you have the what they call the chitlin circuit, right? You have the ones that only work these certain clubs, and that’s because their content is only going to work those certain clubs. And then you have comics like myself and another one of my friends will actually do a show called “Two Queens, One Mic.” She works both the north side and the south side. You know, I would work Jokes and Notes all the time, but then I can also go and work the Laugh Factory. I can also do Up Comedy Club and my stories are transparent. They can go across all three rooms without necessarily having to change them, versus some comics can only work this crowd, because, if they go up north, it’s just going to be a little bit too aggressive with what they’re saying. Like, what they’re saying is not going to resonate with this crowd. Or if they’re a strictly—some that are strictly north-side comics that are black females. They will come to the south side and do terrible, because you got black women, “What are you talking about?” And so, you have to be able to work both. Audience Member #5: One other question for you, since you’re a comedian. Because you’re a comedian, are you looking in the landscape of being on commercials? Of trying to do voice-overs, acting? Because you are a comedian, that’s a whole different ball game to get in there. And filmmaking. KH: So at this point, I’ve removed the label of comedian. I’m just a creator, and that’s on so many different levels. I’m a writer, I do poetry, I can rap if you want me to. Storytelling. I’m definitely a storyteller. I’ve done several storytelling events where that’s the only thing that they book me for. I’ve done commercials. I’ll be on a season of Chicago Justice. I’ve done stand-up on TV numerous amount times. I’m just all over the place. I’m wherever my heart takes me… I think it’s more that I’m a storyteller and I have a story to tell. And I feel like everybody has a story in them. Audience Member #5: Are you teaching in schools, for the children? KH: Possibly. I don’t really like kids that much. [Laughter] I can tolerate kids. But maybe college, possibly, at some point, but I think you’ve got to have a degree, and I don’t have that. So, I don’t know. But, yeah, no, I just like creating. Really, that’s all it is. I just enjoy creating, and that can be with someone, that can be by myself. I do improv. I just love being in front of people and making people laugh about real stuff. Like, a lot of my comedy is not Richard Pryor-like, but I’ve been through a lot, and I talk about that on stage. I talk about having MS. I talk about being diagnosed with bipolar. I talk about having watched children, on stage, and that sometimes makes people uncomfortable, but I don’t care, because it’s not about you being comfortable, it’s about getting that message out in a way that can resonate across all audiences and make people be connected, because that’s really what it’s about. It’s about that connection that we have with one another, because we’ve all lost and we’ve all felt pain. So that doesn’t matter. It doesn’t matter what color you are or, you know what I mean, what the joke is. We’ve all felt that before. And that’s my whole purpose in everything that I do. Audience Member #5: I have a question for you. What other films do you have? I’m curious. DR: I have a film called Kiss Grandmama Goodbye, and it’s a coming-of-age film about a young girl growing up in I guess mid-to-late ‘60s and her relationship with her grandmother. And then, I did—working on down, this is a long series of documentaries about black women with Asperger’s Syndrome. So, I have two in the series that are finished, and I have a couple more to do in that series. And those are long-term because I follow these women for a very long time. Then I worked on other filmmakers’ films as well. Audience Member #5: So your dream came true. You are a filmmaker. DR: Yeah, you just have to make a film. [Laughter] I was clear about that. I made a film that’s done. And basically, that’s how I am. Once I get a vision on something, I’ll just do it. You know, and I try to really convey that to anybody; if you can just think of something, everything is learnable. You know, it’s not miracle-making. You can learn anything. And so, I just finished writing a book of short stories, and so, I’d say in the next two weeks you can actually get that book. Audience Member #6: What’s it called? Moderator: We have time for one more question… We can do two more. Audience Member #7: I just have a quick one. I’m a future educator, so I’m just interested in seeing how you share your creative side with your high school students. DR: Okay, that’s very interesting, because you just asked—One of my students, I’m making a film with him. And here’s my idea of a teacher. It’s, like—this doesn’t go with anything that goes on in the educational system—if a student comes to you and says I want to do this, I figure they must be interested and they’ll learn it, and I’ll say okay. So they don’t realize it, but every last one of them, I’ll always say okay. Even though I’ll question them and whatnot, I’ll say okay. And I had them—they put up posters and people came. For the first time, they were just like this and from us, because, see, I said if you make a film, you’re a filmmaker. So, now, you can be a filmmaker. And kids still look at this film, okay? They enjoyed it so much, and so, all summer he and his partner—I didn’t realize it—had been writing and researching it and whatnot. Isn’t this what you want students to do? And so, they come back at the beginning of the year, and they’re, like, “We want to make this film,” and I said, “Okay!” The principal is, like, “I don’t like the subject matter…” So I had to fight about this, because I told them okay. And so, now, I’m half asleep now because I had to stay until almost seven o’clock on Monday, shooting this film. And he informed me—he said, “Can’t we make this together? You know, we can co-direct.” And I said, “Okay…” [laughter] So that’s it. I hoped it answered your question. That’s how I work. KH: Just be open and say okay. DR: A lot. A lot. And I feel that’s the way school should work, okay? Kids are all willing to learn a lot of things, but it’s like the prison that’s created there is not conducive to that. But the moment you start showing them things and saying okay a lot, then they will not go wrong. Moderator: Tell them about the show. KH: Oh yeah. Two Queens, One Mic. It is every—well, it’s not any particular day, but it’s a once-a-month show at the Revival Theater. The next one is March 25th . I personally won’t be there on this particular show, but my cohost, Randy Denise, and one of our producers, Lisa Beasley, will be there. I am also at Second City every Saturday in the Black Out Cabaret, if you ever want to see an improv show that I’m in. So, yeah, I think that’s probably all I have right now. Oh, I have a podcast called Kellye Talks. And one thing I pride about my podcast, that I love so much, is that we don’t shy away from real topics. So we talk about depression in black communities and things that are ignored on a massive level that I don’t mind talking about because it’s something that needs to be discussed. And sometimes we’re funny and sometimes we’re not. So that’s just that.